In a previous post, I talked about my fatigue and my diagnosis of sleep apnea. I mentioned that I’ve been prescribed modafinil, a wakefulness promoter that’s not really a stimulant, because using the CPAP machine every night did not restore my energy right away. I’ve been taking my modafinil faithfully, and it helps a lot, but not enough to wean me off pretty high-dose caffeine—not yet. I seem to be slowly gaining energy, so I might be able to stop using this stuff eventually. In the meantime, though, it’s very helpful. 2017 Update: This blog post was first published in 2015. I’ve added my 2017 updates here and there throughout the post. The big news for 2017 is that I’ve recovered enough to stop taking modafinil every day! Woo-hoo! I used to take 400 mg every day: 200 mg when I got up, and 200 mg at 11 AM. I cut this down to 100 mg (half a pill) twice a day, then 100 mg once a day. Now I take 50 mg (a quarter of a pill) if I feel like I need it, averaging 50 mg once every week or two. What Remedies Help with Fatigue and Brain Fog? It turns out that pharmaceutical companies around the world have been working like crazy on this problem for decades, and there are a lot of things to try. Some are prescription drugs, but many are herbs, nutrients, or other compounds that are available over the counter. Many have been in use for 30-40 years already and have established track records (though sometimes mostly for other complaints than mine). I’ve tried all the remedies listed below: D-ribose, adrafinil, rhodiola rosea, caffeine, extended-release caffeine, sulbutiamine, and L-theanine. My new favorite supplement is D-Ribose, which seems to give me a significant physical boost. Unlike most supplements in powder form, D-Ribose dissolves in water and tastes fine. Ribose is part of the mitochondrial powerhouse cycle, which I will not even pretend to explain, but it certainly bumped up my physical activity level, in spite of not being a stimulant. I’ve tried both the powder from Bulk Supplements and the chewable tablets from Now Foods. The powder is much ore affordable, and since (unlike most other supplements I mention) the powder is pleasant-tasting rather than disgusting, you might as well try the powder first. 2017 Update: I’m still taking D-Ribose powder daily. I stir it into my morning coffee, where it dissolves easily and tastes just like sugar. Adrafinil is similar to modafinil, and in fact was developed by the same company. Adrafinil is now available over the counter, while Modafinil is a prescription drug that costs an arm and a leg (hundreds of dollars a month!). 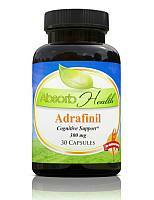 I’ve purchased 300 mg adrafinil capsules from Absorb Health, directly from their Web site. A lot of people who can’t afford modafinil use the more affordable adrafinil instead. It’s less concentrated than modafinil (for me, 300 mg of adrafinil is equivalent to 100 mg of modafinil and it doesn’t last quite as long). If you buy adrafinil in capsule form, it costs about $1 per pill, and a standard dose of 2-4 pills per day works out to $60-$120 per month. Buying it in powder form cuts the price in half, or more. See this translation of the original manufacturer’s (Cepalon’s) package insert for Olmifon, or read the Wikipedia page on adrafinil. 2017 Update: I haven’t taken adrafinil for a long time. When I run out of modafinil, I’ll probably use adrafinil instead, since it’s cheaper and I don’t need the extra kick modafinil gives anymore. This is an herb that has, maybe, some stimulating properties in addition to aiding recovery. But if it’s stimulating, I can’t feel it. Rhodiola rosea is affordable and readily available at places like GNC. I use the Now Foods 500 mg Rhodiola rosea product, taking one on arising and one before lunch. Read more about rhodiola rosea on examine.com. 2017 update: I put rhodiola rosea into a rotation along with echinacea and ginseng. On a month where I take rhodiola rosea, I don’t feel any different than on the others. Caffeine pills restored a great deal of my functionality. It took me a while to realize that high doses of caffeine are essential to my energy and alertness. I don’t know about you, but it works for me. For the last couple of years, I’ve taken a 200 mg immediate-acting caffeine tablet first thing in the morning, at 11 AM, and at 3 PM). Caffeine tables give a reliable increase in my energy level and alertness 20-30 minutes after I take them. Some people point that this is a lot of caffeine, and it is! That’s 600 mg/day, but in fact I also drink coffee and caffeinated diet sodas, so my total intake is probably more like 800 mg/day. That’s twice as much daily intake as is usually recommended. When traveling, I prefer the old standby, Vivarin, since its waxy coating lets me swallow a pill dry. At other times, I prefer inexpensive caffeine tables that I can wash down with water. 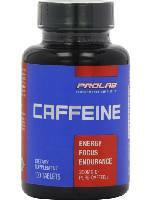 Of the low-cost caffeine tablets, I’ve found the Prolab brand to be completely reliable. Others can be oddly variable in effect, even from pill to pill in the same bottle! Bonus early-morning caffeine tip: Before bed, I set two wake-up alarms, half an hour apart. I keep caffeine pills and a bottle of water next to my bed. When the first alarm goes off, I take a caffeine pill and go back to sleep. When the second alarm goes off, I’m ready to get up. This gets me up far more reliably than expecting myself to find the energy to get up before I take caffeine. The idea behind extended-release caffeine is to avoid that jangly caffeine jolt shortly after taking it. Instead, it’s supposed to give a smooth alertness. I liked the Met-Rx 200 mg capsules, which were very affordable. Sadly, they seem to have been discontinued. They claimed an eight-hour extended release. For me, they lasted 3-4 hours. I’ve tried a couple of other brands, including Sundown Naturals sustained release caffeine, but they didn’t have any effect on me. Other people give this brand very high marks, though, so maybe it’ll work for you. 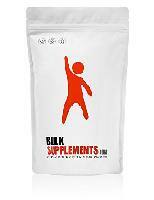 Sulbutiamine is a synthetic form of vitamin B1 that’s also helps keep you going. This is more exotic than Rhodiola rosea but is still available over the counter. I’ve purchased 200 mg sulbutiamine capsules from Amazon.com and from Absorb Health. I used to take four capsules per day. I tapered off after they seemed to lose their punch, and now only take sulbutiamine occasionally. I’ve started buying it in powder form, which is much cheaper. Read the Wikipedia article on sulbutiamine, or the original manufacturer’s instructions for Arcalion, which is just another name for sulbutiamine. 2017 update: It’s been a long time since sulbutiamine had any obvious effect on me, and I no longer use it. This is an amino acid found in green tea, and it counteracts the over-stimulation that you get from caffeine alone, so you get a calmer pick-me-up. I’ve used 200 mg L-theanine capsules from Now Foods. Frankly, I don’t notice much effect from this and stopped using it some time ago. Read the Wikipedia page on L-theanine. This is something of a nuisance, since you have to measure your doses, and many supplements taste awful, but it reduces the price by a lot: 50% for adrafinil and 80% for sulbutiamine. That’s a pretty good incentive. I may write about this in more detail later, but basically you want an inexpensive but accurate electronic scale and probably a simple kit for filling your own capsules. I use two different Lighten-Up sunrise simulators to ramp the lighting in my bedroom from pitch black to very bright over the course of half an hour. The idea is that your body wakes up more easily if you give it firm “it’s morning!” cues, and more comfortably if the light level rises slowly. 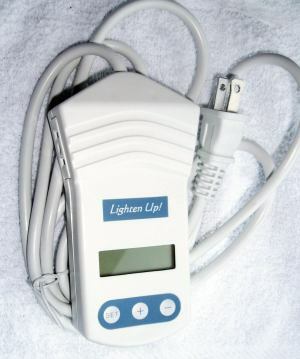 These devices are just programmable lamp dimmers that you use with the lamps of your choice. I have one on my headboard and one at the other end of the room. They work best with incandescent bulbs, but I think I have one of them using a dimmable LED lamp. To help get to sleep, and for the general benefit they provide, I take 3 mg of melatonin and 600 mg of Valerian extract about 90 minutes before bedtime. These aren’t particularly powerful sleep aids, but all they’re supposed to be doing is to point my body in the right direction. My wife and I own a parcel of land on the Island of Eleuthera in the Bahamas. In working to clear the title, we find that a George Plamandon may have been a owner of the land in the 1970s. If you would have any knowledge of this, I would appreciate a steer to George Plamandon. Sorry, I have no knowledge of that branch of the family. As far as I’m aware, all Plamondons in the US radiate out from a single French immigrant to Canada, but that may or may not be relevant to you. Have you tried getting rid of gluten? I have for about two months now and it has changed my life. I am not allergic to gluten, but enough to lower my autoimmune system. I got rid of gluten as a side effect of going on the Atkins diet (which I like). Gluten doesn’t seem to be part of the problem for me. Where do you get the bulk powders? Not finding them on Amazon. Found a couple of other sites but they look more commercial than medical, so not sure if I trust them. Terry, you can get some of the powders there, or buy them in capsule form, like sulbutiamine. And of course herbal supplements are readily available there (My favorite is Rhodiola Rosea). For the rest, I typically buy them from NewNew Star Nootropics. I know this is going to sound insane, but its true. I have been fighting CHF for years and after being on diuretics for 2 years I became totally debilitated but I am better now because I discovered through “hair analysis testing” that i was totally deficient on potassium and sodium, so guess what……. You can’t guess so I will tell you—–eating JUNK FOOD helps increase the strength of my heart! CRAZY!!!!! Anyway my point is maybe some “out there” testing could show you what nutrients you are low in and then taking those would help the fatigue, because i would never have guessed that my whole food, all natural, organic, free range, home made diet would have been lacking anything. I will stop eating junk food (so expensive and junk) and learn to put salt in everything again but it takes years and years to restore potassium levels in the tissues so i may have to use some meds again to help. So other than vivarin, just d ribose powder? What about co q 10 or creatine monohydrate? Steve, thanks for writing! I take CoQ10 as a matter of faith: I don’t notice any short-term benefits. I take creatine intermittenly. Again, no obvious pick-me-up in the short term, or when I stop taking it after taking it for weeks, or when I start again. The three things I place daily reliance on (and can tell if I’ve forgotten a dose) are modafinil, caffeine, and D-ribose. Adrafinil is commonly used as an alternative to the nootropic drug Modafinil which requires a prescription and can be very expensive. Is it true that Adrafinil could be toxic to the liver? I’ve used adrafinil. My impression is that it works okay if you take three times as much, without being as long-lasting as modafinil. The basic adrafinil dose was 300mg, vs 100mg for modafinil. I looked into it as much as I could, with the limited information on the Internet and my nonexistent French. I walked away with the impression that the “hard on the liver” line is hokum. The real story was that modafinil had a brand-new patent that guaranteed 20 years of ultra-high profits, while adrafinil’s patent had expired, leaving the manufacturer open to competition from generics. So they pulled it from the market with some “hard on the liver” mumbo-jumbo. As far as I can tell, this was a mere assertion, not based on actual cases. Adrafinil was marketed for elderly patients with “brain fog” and was expected to be taken daily forever. More information on Adrafinil, including the package insert. I was just checking to see if there was any update to this article ? Thanks . Just updated it today. Thanks for the reminder! Previous Previous post: How Many Chickens Per Acre?